A kitchen we designed, supplied and fitted back in 2015. Our thanks and appreciation go to Jackie for sending us some photos. The kitchen range is Next125, the colour is Lava black in glass gloss finish combined with contrasting coloured wall units in Polar white, all featuring the ‘letter box’ style insert handle for that handle-less look without grip rails. 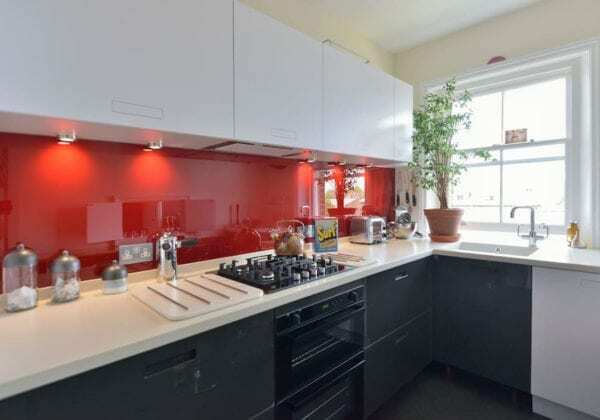 The worktop is 38 mm corian in the colour Bone on a timber subframe with single pencil profile and 50 mm coved upstands all set against a vibrant red glass splashback in gloss finish.